I'm giving away one free entry to a Rock n Roll Marathon North America Race! One of my favorite race organizations is the Rock n Roll Marathon series. A little over a year ago, Gabe and I decided we would sign up for our first racecation - the Rock n Roll Half Marathon in New Orleans. 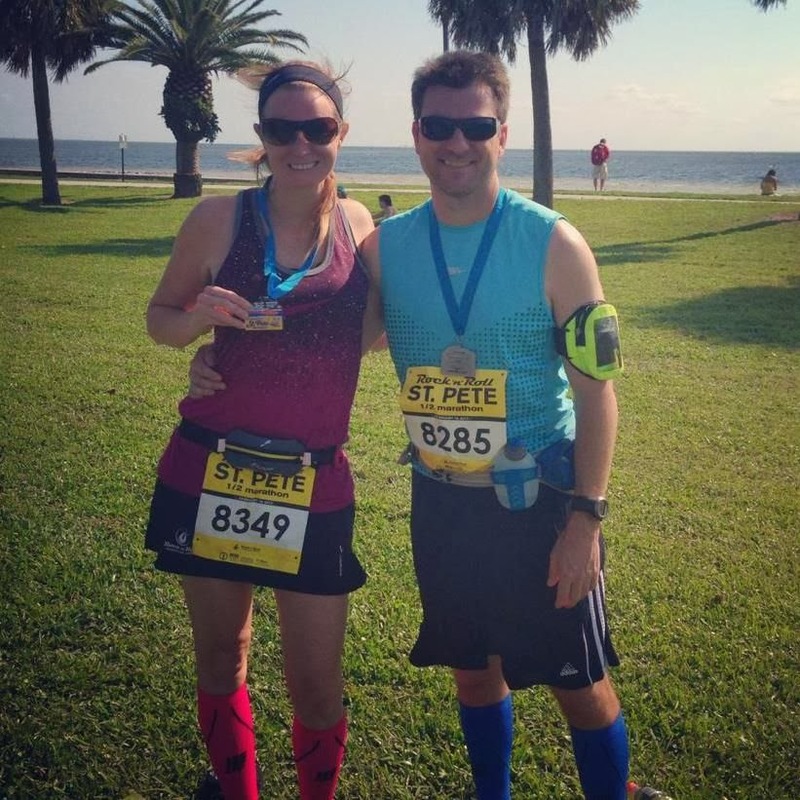 During registration, we ended up signing up for the Rock n Roll Half in St. Pete so we could get a RNR Heavy Medal, the Rock Encore medal for completing two RNR series in one year. 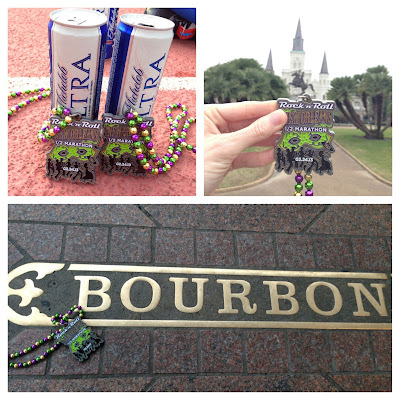 You can read my RNR NOLA recap here and my RNR St Pete recap here. We had a wonderful time at both Rock n Roll Marathon series events. The RNR series is extremely well organized and I tell everyone I know who runs that they must do one of their events. In 2014, we are talking about running RNR Las Vegas! One of the great things Rock n Roll series does is offer a Tour Pass, where you pay $200 for a package of any three races in the US or $400 to run however many races you wanted to run in the US. Thinking about how much I spend annually on races for Gabe & I makes my head hurt and this I can tell you is an excellent deal! We are considering getting the pass in 2015, after the wedding! To enter, leave me a comment below letting me know which of the above listed races you would want to participate in. I strongly suggest NOLA :) Make sure register your entries through the rafflecopter widget below and come back daily for more chances to win. Good luck! I think I would choose Vegas because it always seems fun! I'd choose San Diego. I live here and it's always the week of my birthday. I'd pick Savannah because it is the closest one to us. Cleveland because I could visit my best friend! I would choose San Antonio- although if I COULD, I'd pick Denver so I could run with my best friend! I would chose Nashville! Ive always wanted to visit and whats a better way to view a town other then running it??! I would choose Philadelphia, PA because September is a great running month on the east coast and I've heard that the Philly Rock & Roll Half is a ton of fun! It would also be a great training race before my first marathon on Oct 19th! I'd choose Vegas! I've never been and this would be the perfect excuse to go. 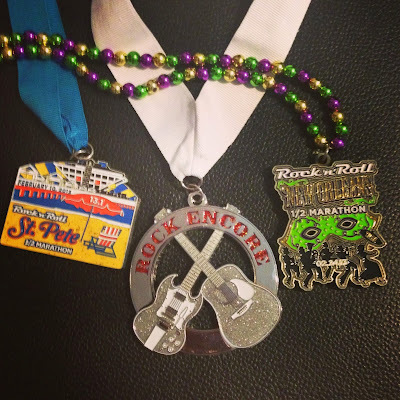 Would love to run RNR New Orleans! I have run New Orleans too and it was great. I've always wanted to run Savannah! Considering my daughter's middle name is Nola - I would of course pick New Orleans. I'm already registered for Vegas and Portand - this would make it a beautiful trifecta! New Orleans. It was great at the Inaugural; I would definitely do it again. I would do Cleveland again or New Orleans. I would run the Las Vegas RnR! They shut down the strip, how cool is that?? Nashville because it is my birthday. Last year is was at R&R for DC in March and San Diego in June as a spectator. I think it would be fun to run. I would run New Orleans because it would be my first out of state marathon and it's not that far of a drive from Dallas. I would pick NOLA, there is a group ofrunners from my area already traveling to that race. I could crash the party! I would pick either Nashville or New Orleans so I could cross off another state in my 50 state quest. I'd pretty much run any of them! I'd love to add another RnR race to my medal stand! I've been wanting an excuse to visit Savannah for a while, so I would love to run there! I live about 6 hours away in FL so this could be an awesome way for a cheap racecation!! Cleveland and Chicago are close to home. But, I've never been to Vegas, what better reason to go than to run a marathon! I would do either Dallas because it's close to home or Raleigh because my sister lives out there! I would talk my brother-in-law to run with me! My husband and I celebrated our honeymoon with a trip to Vegas this past year for the R&R series!! Do it! Most amazing experience!! If I won, I would want to run Brooklyn. It's close to home, and would be my first marathon! I would pick Savannah or Raleigh! Savannah was amazing this year, but I want to try Raleigh! Tough call - excited about any!! chicago so I could visit a friend!! Chicago! Its on my calendar but haven't registered yet. Maybe Raleigh..or DC..or NOLA...hard to decide! San Diego or Vegas... you can definitely rock a run in these two awesome cities!